Although many regiments had bands for marching and parade purposes, it was during the Seven Years War (1756-63) that the Officers of the Royal Artillery serving in Germany felt that they wanted a ‘more musical’ ensemble to play on social occasions. At the instigation of Captain William Phillips the ‘Royal Artillery Band and Orchestra’ was formed, consisting ‘of eight men, who must also be capable to play upon the violoncello, bass, violin and flute’. The Musicians could perform as a parade band or orchestra as required, and this double-handed tradition was maintained until 2014 when the dedicated Countess of Wessex’s String Orchestra was established in Woolwich. With the signing of the Peace of Paris in 1763 British Troops were withdrawn from Germany and the newly formed ensemble returned with the regiment to Woolwich, making The Royal Artillery Orchestra the oldest established Orchestra in Great Britain. In 1801, when the Royal Irish Artillery Band was amalgamated with the Royal Artillery Band, the number of personnel increased to 22, and subsequently the then Master Musician, George McKenzie (1810-45) devoted a lot of attention to the Orchestra. Between 1810 and 1815 the famed Royal Artillery Concerts began, and they were to become a regular feature of London musical life for well over a century. Master Musician James Smyth (1854-81) directed many premier performances, most notably in 1868 the overture to Wagner’s Die Meistersinger, which was not performed by the Philharmonic Orchestra until 1882. Master Musician Ladislao Zavertal (1881-1906) was to lead the Band and Orchestra, to its most celebrated heights. Under his leadership the now 88 person strong Orchestra attracted audiences and distinguished guests from all over London to winter concerts in Woolwich. Such was the orchestra’s standard of performance that on a number of occasions Queen Victoria engaged the Orchestra by Royal Command to play during and after state banquets. In addition the Band and Orchestra had many famous admirers including Sir Edward Elgar and Sir Edward German. Zavertal was good friends with Anton Dvorak, who visited Woolwich and the Orchestra’s rehearsal room a number of times to try out his pieces. It’s highly likely that Dvorak’s New World Symphony was first played by the Royal Artillery Orchestra. However, not content with this, Zavertal sought a yet wider audience, organising a series of concerts at the Royal Albert Hall, the Queen’s Hall and St James’s Hall. 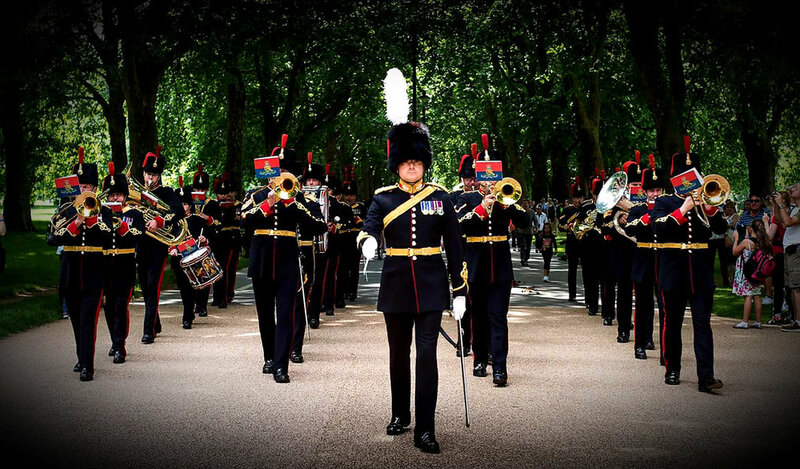 The Band continues to perform around the world supporting the Royal Regiment of Artillery and the wider Armed Forces. The Band has also played in different parts of the world; New Zealand, America, France, Germany, Hungary, Slovenia, Africa, Switzerland, China and more recently Russia representing Great Britain in the 2011 Moscow Tattoo. Their most recent trip was to India in support of UK Defence diplomacy in 2014. The Royal Artillery Band has now relocated to Tidworth Garrison as part of the restructuring of Army Music, FAM2020 and is now classed as a Multi Capability Band – MCB. The band remains proud to continue the many musical traditions of over 300 years in the history of British military music and is also keen to broaden its appeal through its musical diversity. From within its number, the band is also able to provide a number of smaller ensembles including a Pop Group, Rock Band, Jazz Combo, Big Band, Brass & Wind Quintets and Saxophone & Clarinet Quartets.